The western Himalaya experiences a considerable number of earthquakes of varying magnitudes; the most well-known one being the 1905 Kangra earthquake. 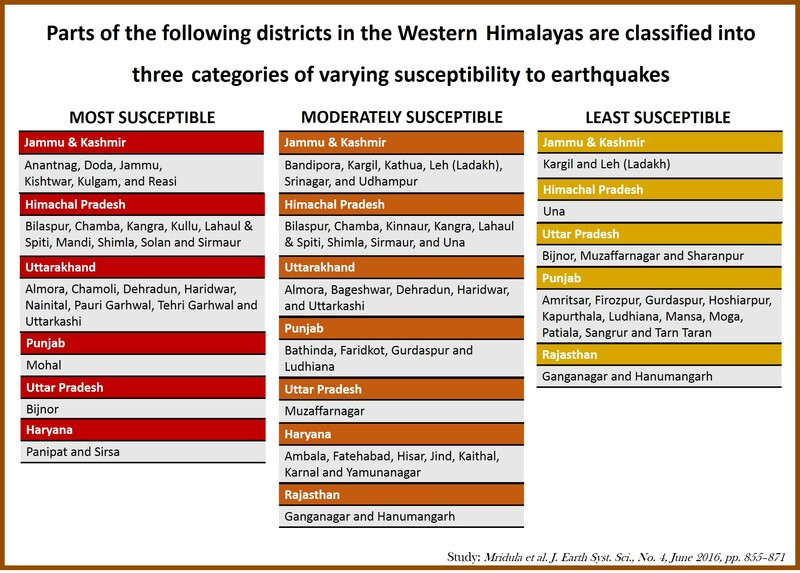 Different regions in the western Himalaya –comprising the states of Jammu & Kashmir, Himachal Pradesh and Uttarakhand –are known to exhibit varying degrees of seismicity. Thus, in order to have a better disaster management system and for improved disaster mitigation, it becomes necessary to differentiate the seismically more-vulnerable regions from the less-vulnerable ones. A group from the Department of Earthquake Engineering, IIT Roorkee, has identified seismically susceptible areas in the western Himalaya. Profs Mridula, Amita Sinvhal and Hans Raj Wason have shown that most of Himachal Pradesh and Uttarakhand and a few regions of Jammu & Kashmir, Punjab, Uttar Pradesh and Haryana are at the greatest risk. Most of Jammu & Kashmir was found to be only moderately susceptible, while the Indo-Gangetic plains appeared to be the least susceptible. Their findings have shown that several earthquake zones categorised in the ‘seismic zoning map’ by the Bureau of Indian Standards need to be reworked. For this study, they used the technique of ‘pattern recognition’. Simply put, PR technique, is a form of machine learning that relies on various available tectonic and seismology data of the region. The data was sourced from seismic events that have occurred beginning from the year 1552. The data needed to be appropriately and accurately categorised based on a set of parameters (such as the magnitude of the earthquakes and various features of the earth’s landscape) and fed into the system. The PR technique can then predict future earthquakes based on the recognition of existing patterns. “This study allowed us to identify and narrow down areas where most recent earthquakes are originating, and also where strong earthquakes may recur. These results can contribute to improving the characterisation of seismic sources for seismic hazard assessment,” the scientists state in their study. The work is published in the Journal of Earth System Science in June 2016. Link here.